You probably think I’m lying but I promise you, this cake is SO easy to make. Simply prepare your favorite chocolate cake and vanilla cake recipe. (Note: In order to make your vanilla cake into pumpkin cake substitute once can of pumpkin and 1 cup of water for all wet ingredients. Also add 2-3 teaspoons of pumpkin pie spice.) Bake off in four 8-inch or 9-inch round pans. After letting cakes cool completely, it’s time to assemble. Whip up your favorite cream cheese frosting recipe (mine is 4 cups powdered sugar, 1 stick softened butter, 1 eight oz. package of softened cream cheese and a splash of cream to adjust the texture). 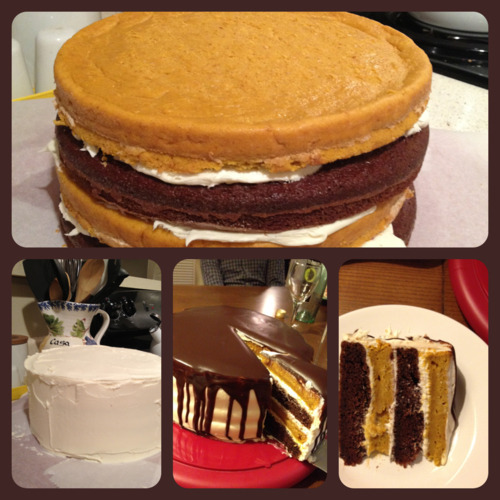 Begin stacking and frosting the layers. Let cake set in the fridge for about 30 min to one hour. In the mean time make your ganache. For this cake I used 6 oz. semisweet chocolate chips, 2/3 cup heavy cream and a table spoon of light corn syrup (to make it shiny). Heat cream and corn syrup and pour it over the chocolate chips. Mix gently until melted, smooth and completely combined. Let cool for 10-20 min. Remove cake and slowly spoon ganache over the cake until the desired effect is reached. It is best to have pieces of parchment under your cake so that you can slide them out and remove excess ganache without a mess. Ganache could take up to a day to set so my advice is to make this cake one day in advance of when you need it. The cake is best if consumed with 5-6 days of making it. But I doubt yours will last that long. This was a surefire hit among my friends. Enjoy and Happy Baking!